I thought since there is a cast iron thread this would compliment it good. I love this stuff not only for the look but for functionality too. It is fairly lightweight, strong, and the best thing easy to clean. This is my most recent purchase. 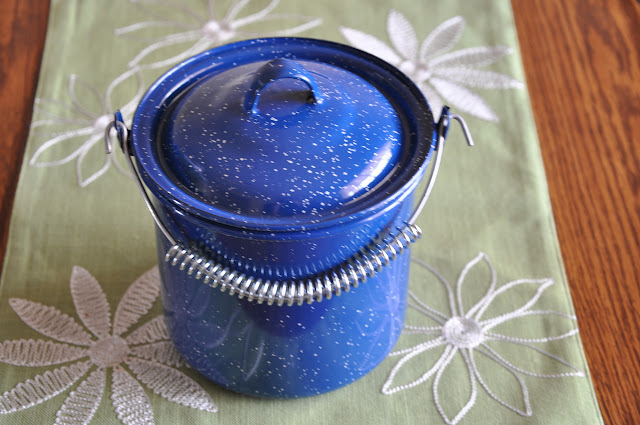 This is my choice of a Billy Pot. 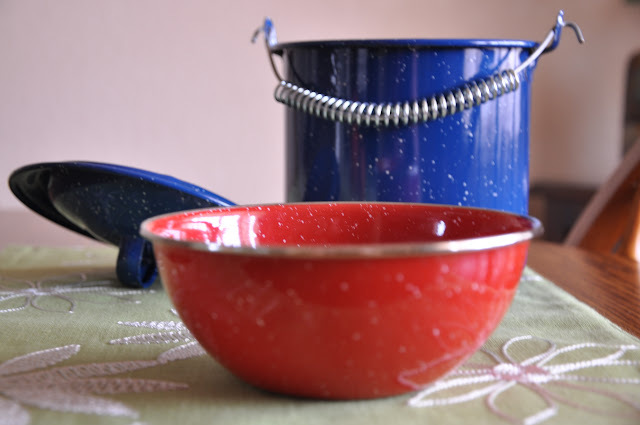 It is a GSI STRAIGHT POT W/ LID 1.75 QT.- BLUE for just under $10 and a Mixing Bowl Stainless Rim 5.75?- Red for $6. I decided to get them when I fitted the bowl inside the pot and they fit perfectly. I thought I could use this as a double boiler for making pine pitch glue or birch tar from the oil. I added the spring on the handle for less than $2 it didn't come with it. The other parts are the Cup 24 fl. oz.- Red (I got one without the stainless steel rim as I found out those rims like to grab hold of mustache hairs regularly) that I decided to get for my winter kit after reading Snow Walker's Companion by Garrett & Alexandra Conover. 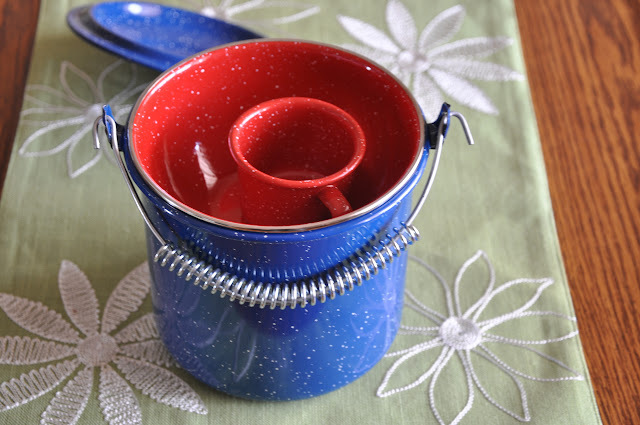 Enameled cups are great for re-waxing sled runners, tobaggans, and skis by using the bottom of a warm cup. The big cup nests over my 24oz Stanley food jar/thermos perfectly. I had to get the little expresso cup for what I don't know. I thought it would come in handy for something other than expresso. 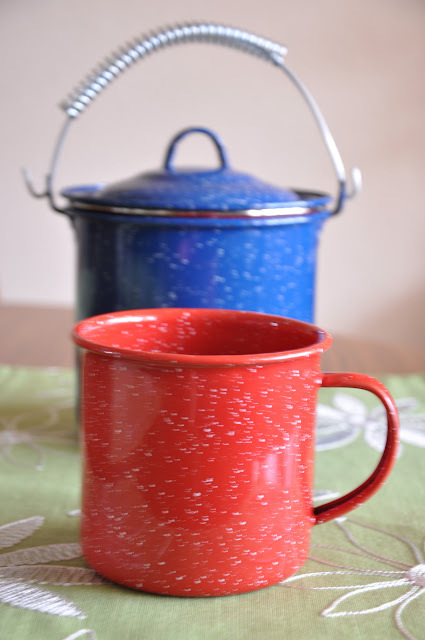 If you get the red or green it is much thicker enamel and harder wearing but the pots only come in blue. Anyone else love this stuff as much as me? I like that pot. Where do you find those? And an off the wall question: Could one do a stir fry with that bowl over flames? Ya nothing should taste of metallic that's for sure. Is yours older? The new stuff is all tested for lead and cadmium if it is sold in the US, some of the older stuff years ago was not. Yes enamelware does just fine in coals and over flames. I imagine you could do stir fry with it but it might be small for that. They do make bigger sizes. I got them at Sportsman's Warehouse but they have them in most camping/outdoor stores. Thank you BB.. I'll have to keep an eye out for that pot for sure. I love my $2 blue enamelware cup. Nests with a 24oz water bottle with room to spare. That's pretty cool Barbarossa, it's like a homemade enamil mess kit. Nice idea. 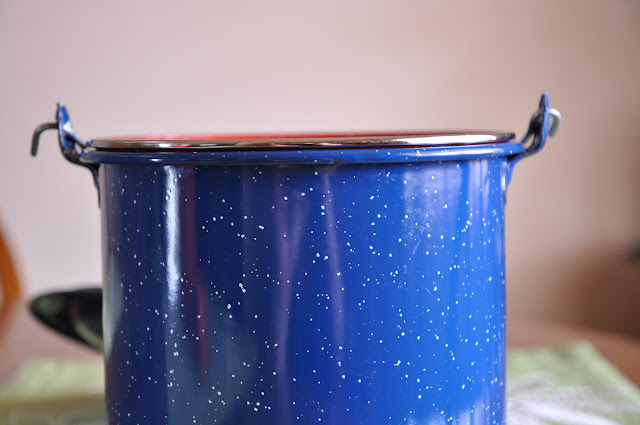 I used to use the enamelware stuff way back when, but no longer, mostly because the cups would burn your lips with hot food and cool off too fast, same with the plates, pots and pans had hot spots and would cool off too quickly, and everything would end up getting chipped and would end up with rust spots. Now I use a combination of different cookware for different applications, my bushcraft kit consists mostly of stainless, a GI mess kit, Gyott water bottle and Glaser cup, GI canteen cup and or a SS billy pot. In my van for car camping, I use a few heavy stainless pots and skillet for cooking over the gas camp stove, and for cooking over campfire coals I use cast iron in the form of a dutch oven and skillet, and I have two pots, a kettle, and a coffee pot that are hand made of copper that have been tinned with a food safe coating that I got from Westminster Forge quite a few years ago and they have held up very well. For the trail I use the top of my mess kit or a cup to eat off of, but for car camping out of the van we use a mix of old dinnerware or paper plates and odd silverware and utensils, and i keep a set of decent kitchen knives for food prep along with a vinyl cutting board, I also have a few cedar planks for cooking fish on as well. Oh man, that brings me back. All my family's old enamel ware is now decorating a shelf with the other antiques. I love the looks of the stuff, and the nostalgia, but don't care to use it any more. Like a few others, I found it gets too hot, and then cools too fast. By the time the cup cools off enough to drink, the contents are cool, too. My old coffee pot was the last to go. Once it got chipped in a couple places, the rust was like a cancer under the enamel.